Exactly. People don't generally announce in public that they shop at the Salvation Army, Value Village or Goodwill. But my teenage daughters love shopping at the thrift store. It's not that they like saving money. It's that they can get more clothes. I know those are two sides of the same coin, but it's a fundamentally different attitude. Hands up everybody who shops at a thrift store. In my mind, this is a very healthy way to think about money. You have what you have, it's all about how you allocate it. In this case, you start with $50. You can get one piece of clothing, or you can get six. That's an easy choice. Who cares about the social taboo? Of course, it is more complicated than that. You might like that one pair of fancy, new jeans more than the two pair of used jeans, two t-shirts, the belt and the blouse put together. It's also possible that you'll get more usage out of a new piece of clothing than out of something that has already been worn. It's not just clothes -- they also buy books and some other items -- but it's mostly clothes, because that's what teenage girls seem to like. My daughters don't have a formal checklist for selecting thrift store clothing. Here is the list they would make, based on my observations, if they were to write it down. Yes, the first thing they look for is something that appeals to their taste. This is no different than in any other store. What catches their eye is their shopping universe. The second question, which is not always answered by the first, is whether the item is in style. At a thrift store, the history of the clothing is varied. One shirt might be six months old, and the shirt next to it might be 16 years old. As this Thrift Store Dad browses through the ties while waiting for the girls to do their shopping, I see all different widths. The current style is near the middle, about two inches wide. But there are one -inch and three-inch and funny old four-inch wide ties, too. Five years from now, I might bite my tongue to call four-inch-wide ties "funny old", but right now, I would not wear those. On the other hand, all the variety of styles gives a person a chance to mix and match in bold new ways. Thrift stores almost redefine style. The thrift stores we usually visit are pretty good about not putting out anything that is ripped or badly worn. Still, some items might start to show their wear. No point buying something that will just have to be thrown out soon. I don't know if every thrift store has a change room. My daughters make sure the item fits and looks good on them. And their parents try to make sure they look decent on them, although that aspect seems to be lost on teenagers these days. "It's a must to shop at the thrift stores located in affluent neighborhoods. Who has the best clothes? Those guys. They'll donate often, especially during the 'spring cleaning' time of the year and during seasonal cross-overs. You need to check back often, because next week there will be a ton of newly donated pieces on the racks." I had never thought about the location before. We usually go to the Value Village in east end Ottawa, just because it is on our way in and out of the city. But we have shopped at others. They all seem to be in major commercial areas. In other words, people from many neighbourhoods, rich and poor alike, would drop off their clothes. However, I suspect that suburban stores would have better quality items than urban stores. We've been to the store in Orleans once, but I didn't pay attention to the quality of the clothes there. The next time we are in the area, I think I will. 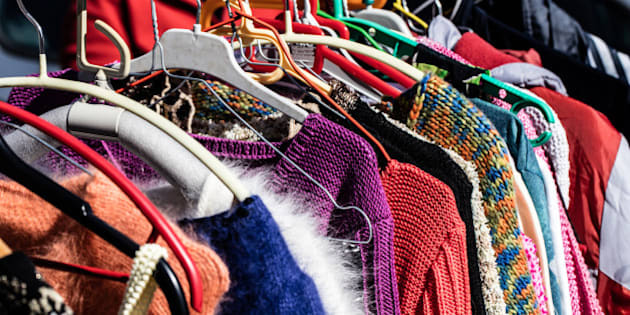 The Huffington Post has more good tips for buying second-hand, although they don't all apply to thrift stores. You might be asking whether the Thrift Store Dad would shop for himself at a thrift store. Given how rarely I buy clothes for myself, the odds are against it. But if I found myself in need of new clothes, it would be the first place I shop.